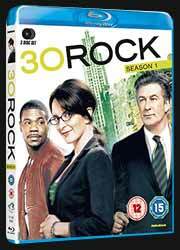 On paper 30 Rock shouldn't work. It's a comedy show about writing on a comedy show. And, to be honest, while I enjoyed this first season, I really can't believe that there was enough material to squeeze 7 seasons out of it. I was starting to tire of the format before the season ended. The show was written by Tina Fey, who also stars as Liz Lemon, and ran for seven seasons from 2006-2013. Fey used her experiences of being the head writer for Saturday Night Live as a jumping off point for the creation of 30 Rock. The title comes from the address of NBC's Studios where TGS with Tracy Jordan is supposedly filmed (30 Rockefeller Plaza in New York City). Tina Fey also took an entire episode from this season ('The Baby Show') and used it as the groundwork for the 2008 movie Baby Mama!, a comedy vehicle for her and Amy Poehler. As with most show's of this nature, it all boils down to whether you like the characters or not. If you can't invest in them, you're unlikely to enjoy the scrapes they get into. Here Fey is surrounded by some great co-stars, all of whom help to round out the show. While the show is enjoyable, you can buy the entire show's seven seasons on DVD for not much more than this Blu-ray release of the first season. And while it's nice to have a crisp Blu-ray release, I think casual fans will be better off buying the entire show's boxset on DVD.